, professor of mathematics in the king’s academy at Woolwich, fellow of the Royal Society, and member of the royal academy at Stockholm, was born at Market-Bosworth, in Leicestershire, Aug. 20, 1710. His father was a stuff-weaver in that town: and, though in tolerable circumstances, yet, intending to bring up his son to his own business, he took so little care of his | education, that he was only taught English. But nature had furnished him with talents and a genius for far other pursuits, which led him afterwards to tut: highest rank in the mathematical and philosophical sciences. 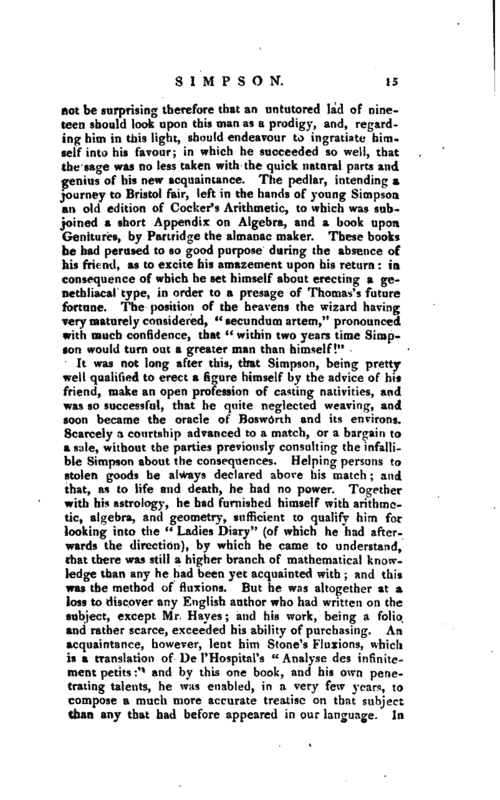 Young Simpson very soon gave indications of his turn for study in general, by ragerly reading all books he could meet with, teaching himself to write, and embracing every opportunity he could find of deriving knowledge from other persons. His father observing him thus to neglect his business, by spending his time in reading what he thought useless books, and following other such like pursuits, used all his endeavours to check his proceedings, and to induce him to follow his profession with steadiness and better effect. But after many struggles for this purpose, the differences thus produced between them at length rose to such a height, that our author quitted his father’s house entirely. Upon this occasion he repaired to Nuneaton, a town at a small distance from Bosworth, where he went to lodge at the house of a taylor’s widow, of the name of Swinfield, who had been left with two children, a daughter and a son, by her husband, of whom the son, who was the younger, being but about two years older than Simpson, had become his intimate friend and companion. And here he continued some time, working at his trade, and improving his knowledge by reading such books as he could procure. Among several other circumstances which, long before this, gave occasion to shew our author’s early thirst for knowledge, as well as proving a fresh incitement to acquire it, was that of a large solar eclipse, which took place on the llth day of May, 1724. This phenomenon, so awful to many who are ignorant of the cause of it, struck the mind of young Simpson with a strong curiosity to discover the reason of it, and to be able to predict the like surprising events. It was, however, several years before he could obtain his desire, which at length was gratified by the following accident. After he been some time at Mrs. Swinfield’s, at Nuneaton., a travelling pedlar came that way, and took a lodging at the same house, according to his usual custom. This man, to his profession of an itinerant merchant, had joined the more profitable one of a fortuneteller, which he performed by means of judicial astrology. Every one knows with what regard persons of such a cast are treated by the inhabitants of country villages; it | cannot be surprising therefore that an untutored lad of nineteen should look upon this man as a prodigy, and, regardin^ him in this lignt, should endeavour to ingratiate himself into his favour; in which he succeeded so well, that the sage was no less taken with the quick natural parts and genius of his new acquaintance. The pedlar, intending a journey to Bristol fair, left in the hands of young Simpson a i oK! edition of Cocker’s Arithmetic, to which was subjo i.ed a short Appendix on Algebra, and a book tipoa Gemtim s, by Partridge the almanac maker. These books h 11 “‘ perused to so good purpose during the absence of his f’ri<-nd, as to excite his amazement upon his return in consequence of which he set himself about erecting a genethliacal type, in order to a presage of Thomas’s future fortune. The position of the heavens the wizard having very maturely considered,” secundum artem,“pronounced with much confidence, that” within two years time Simpson would turn out a greater man than himself!" It was not long after this, that Simpson, being pretty well qualified to erect a figure himself by the advice of his friend, make an open profession of casting nativities, and was so successful, that he quite neglected weaving, and soon became the oracle of Bosworth and its environs. Scarcely a courtship advanced to. a match, or a bargain to a sale, without the parties previously consulting the infallible Simpson about the consequences. Helping persons to stolen goods he always declared above his match; and that, as to life and death, he had no power. Together witii his astrologv, he had furnished himself with arithmetic, algebra, and geometry, sufficient to qualify him for looking into the “Ladies Diary-” (of which he had afterwards the direction), by which he came to understand, that there was still a higher branch of mathematical knowledge than any he had been yet acquainted with; and this was the method of fluxions. 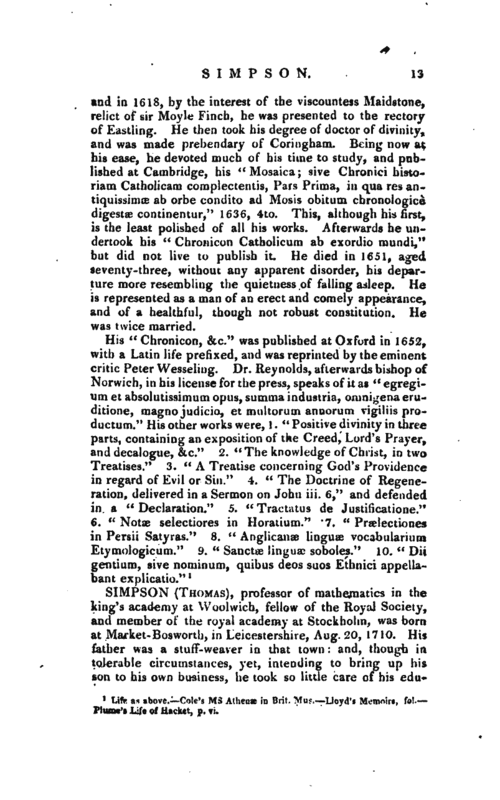 But he was altogether at a loss to discover any English author who had written on the subject, except Mr. Hayes; and his work, being a folio and rather scarce, exceeded his ability of purchasing. An acquaintance, however, lent him Stone’s Fluxions, which is a translation of De l’Hospital’s “Analyse des infinitement petits” and by this one book, and his own penetrn<:; tJents, he was enabled, in a very few years, to compose a much more accurate treatise on that subject tnan any that had before appeared in our language. In | the mean time an unfortunate event involved him in a deal of trouble. Having undertaken to raise the devil, in order to answer certain questions to a joung woman, who consulted him respecting her sweetheart, then absent at sea, the credulous girl was so frightened on the appearance of a man from beneath some straw, who represented the devil, that she fell into violent fits, from which she was with difficulty recovered, and which for a considerable time threatened insanity or fatuity. In consequence of this exertion of his art, he was obliged to leave the place, and he removed to Derby, where he remained a few years, working at his trade by day, and instructing pupils in the evening. It would seem that Simpson had an early turn for versifying, both from the circumstance of a song written here in favour of the Cavendish family, on occasion of the parliamentary election at that place, in 1733; and from his first two mathematical questions that were published in the “Ladies Diary,” which were both in a set of verses, not ill written for the occasion. These were printed in the Diary for 1736, and therefore must at latest have been written in 1735. These two questions, being at that time pretty difficult ones, shew the great progress he had even then made in the mathematics; and from an expression in the first of them, viz. where he mentions his residence as being in latitude 52, it appears he was not then come up to London, though he must have done so very soon after. After, however, he took leave of astrology and its emoluments, he was driven to hardships for the subsistence of his family, having married the taylor’s widow with two children, who soon brought him two more. He, therefore, came up to London in 1735 or 1736, and for some time wrought at his business in Spitalfields, and taught mathematics when he had any spare time. His industry soon became so productive, that he was enabled to bring up his wife and children to settle in London. 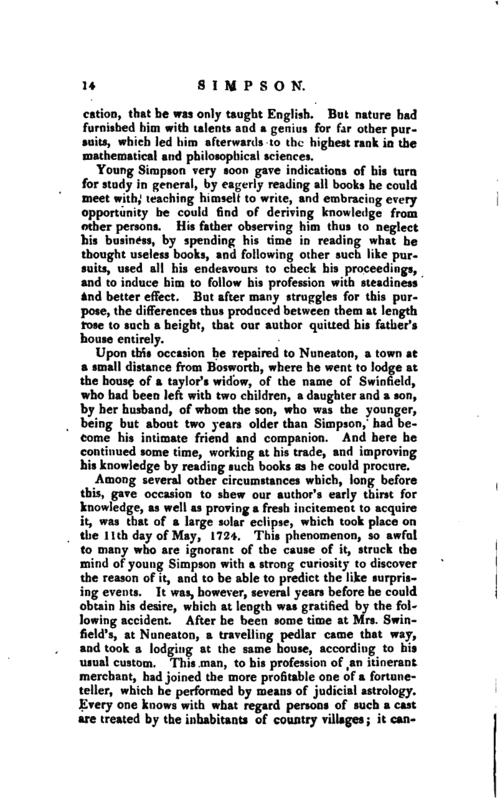 The number of his scholars increasing, and his abilities becoming in some measure known to the public, he issued proposals for publishing, by subscription, “A new Treatise of Fluxions, wherein the Direct and Inverse Method are demonstrated after a new, clear, and concise manner; with their application to Physics and Astronomy. Also the Doctrine of infinite Series and reverting Senes universally and amply explained; fluxionary and exponential Equations solved,” &c. When he first proposed his intentions of publishing | such a work, he did not know of any English book founded on the true principles of fluxions, that contained any thing material, especially the practical part; and, though some progress had been made by several learned and ingenious gentlemen, the principles were nevertheless left obscure and defective, and all that had been done by nny of them in “infinite series” very inconsiderable. The book was not published till 1737, 4to; the author having been frequently interrupted from furnishing the press so fast as he could have wished, through his unavoidable attention to his pupils for his immediate support. 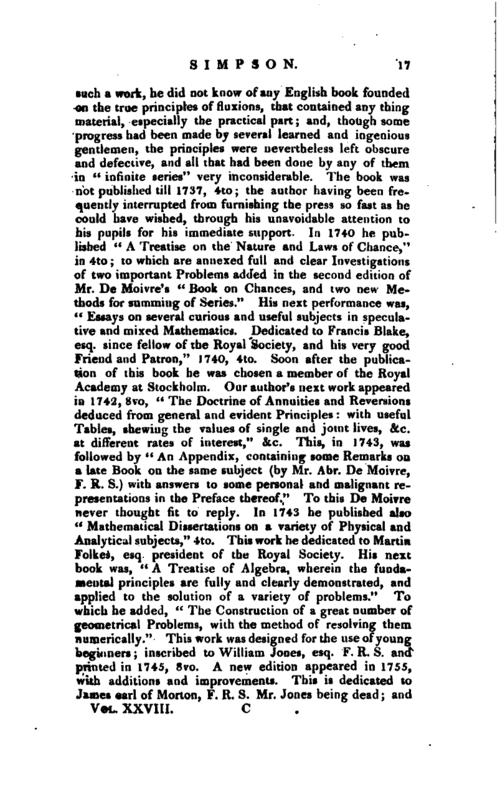 In 1740 he published “A Treatise on the Nature and Laws of Chance,” in 4to; to which are annexed full and clear Investigati ns of two important Problems added in the second edition of Mr. De Moivre’s “Book on Chances, and two new Methods for summing of Series.” His next performance was, “Essays on several curious and useful subjects in speculative and mixed Mathematics. Dedicated to Francis Blake, esq. since fellow of the Royal Society, and his very good Friend and Patron,” 174-0, 4to. Soon after the publication of this book he was chosen a member of the Royal Academy at Stockholm. 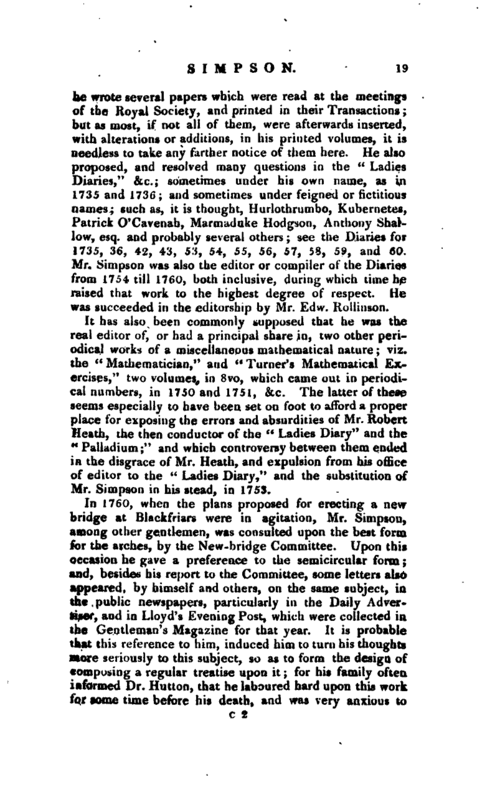 Our author’s next work appeared in 1742, 8vo, “The Doctrine of Annuities and Reversions deduced from general and evident Principles: with useful Tables, shewing the values of single and joint lives, &c. at different rates of interest,” &c. This, in 1743, was followed by “An Appendix, containing some Remarks on a late Book on the same subject (by Mr. Abr. De Moivre, F. R. S.) with answers to some personal and malignant representations in the Preface thereof.” To this De Moivre never thought fit to reply. 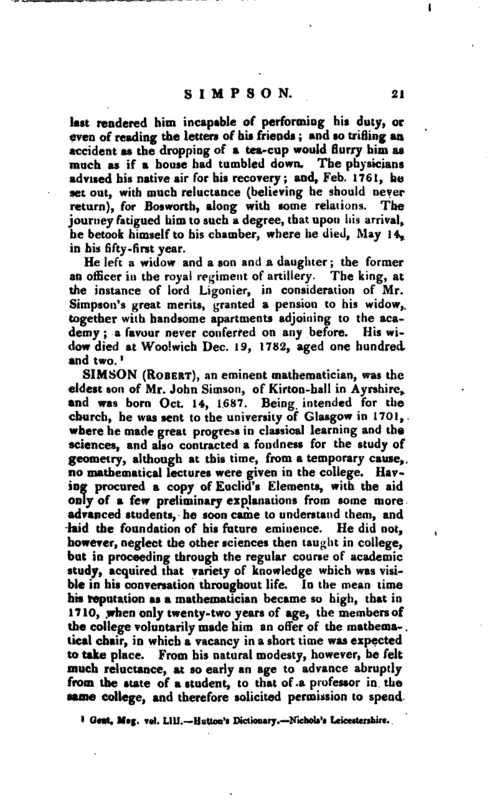 In 1743 he published also “Mathematical Dissertations on a variety of Physical and Analytical subjects,” 4to. This work he dedicated to Martin Folkes, esq. president of the Royal Society. 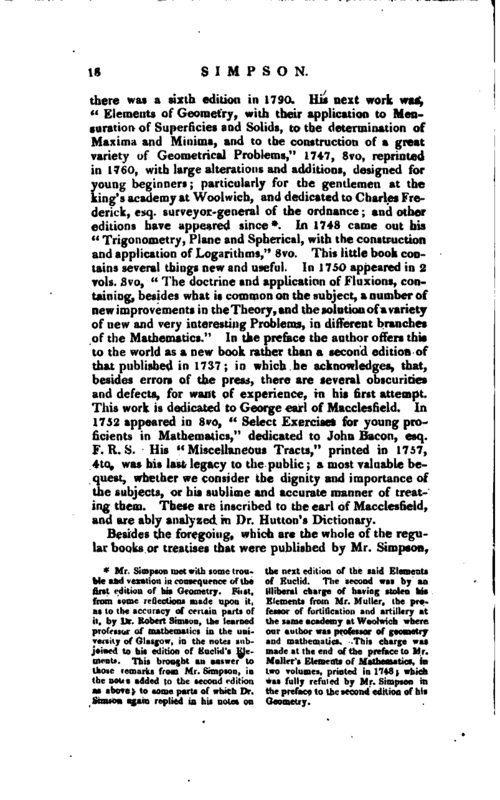 His next book was, “A Treatise of Algebra, wherein the fundamental principles are fully and clearly demonstrated, and applied to the solution of a variety of problems.” To which he added, “The Construction of a great number of geometrical Problems, with the method of resolving them numerically.” This work was designed for the use of young beginners; inscribed to William Jones, esq. F. R. S. and printed in 1745, 8vo. A new edition appeared in 1755, with additions and improvements. 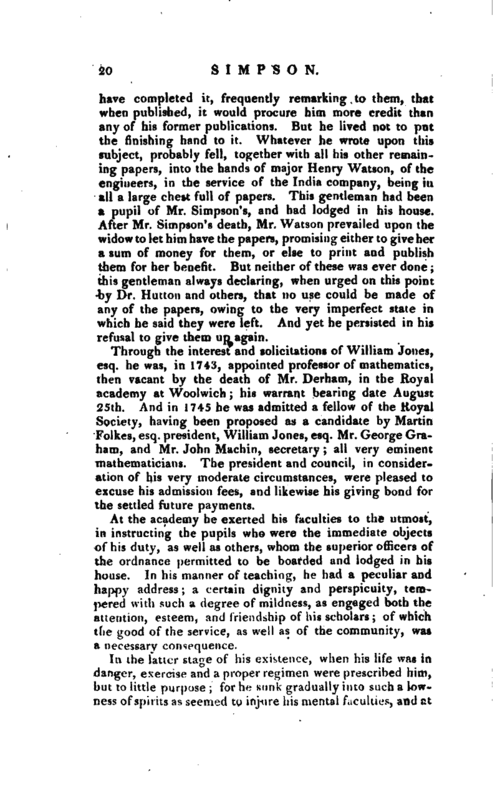 This is dedicated to James earl of Morton, F. R. S. Mr. Jones being dead; and | there was a sixth edition in 1790. His next work was, “Elements of Geometry, with their application to Mensuration of Superficies and Solids, to the determination of Maxima and Minima, and to the construction of a great variety of Geometrical Problems,” 1747, 8vo, reprinted in 1760, with large alterations and additions, designed for young beginners; particularly for the gentlemen at the king’s academy at Woolwich, and dedicated to Charles Frederick, esq. surveyor-general of the ordnance; and other editions have appeared since*. In 1748 came out his “Trigonometry, Plane and Spherical, with the construction and application of Logarithms,” 8vo. This little book contains several things new and useful. In 1750 appeared in 2 vols. 8vo, “The doctrine and application of Fluxions, containing, besides what is common on the subject, a number of new improvements in the Theory,and the solution of a variety of new and very interesting Problems, in different branches of the Mathematics.” In the preface the author offers this to the world as a new book rather than a second edition of that published in 1737; in which he acknowledges, that, besides errors of the press, there are several obscurities and defects, for want of experience, in his first attempt. This work is dedicated to George earl of Mat-clesfield. In 1752 appeared in 8vo, “Select Exercises for young proficients in Mathematics,” dedicated to John Bacon, esq. F. R. S. His “Miscellaneous Tracts,” printed in 1757, 4to, was his last legacy to the public; a most valuable bequest, whether we consider the dignity and importance of the subjects, or his sublime and accurate manner of treating them. These are inscribed to the earl of Macclesfield, and are ably analyzed in Dr. Hutton’s Dictionary. joined to his edition of Euclid’s Ele- ma<\c at the r ud of the preface to Mr.
bimson again replied in his notes on Geometry. | he wrote several papers which were read at the meetings of the Royal Society, and printed in their Transactions; but as most, if not all of them, were afterwards inserted, with alterations or additions, in his printed volumes, it is needless to take any farther notice of them here. He also proposed, and resolved many questions in the “Ladies Diaries,” &c.; sometimes under his own name, as in 1735 and 1736; and sometimes under feigned or fictitious names; such as, it is thought, Hurlothrumbo, Kubernetes, Patrick O’Cavenah, Marmaduke Hodgson, Anthony Shallow, esq. and probably several others; see the Diaries for 1735, 36, 42, 43, 53, 54, 55, 56, 57, 58, 59, and 60. 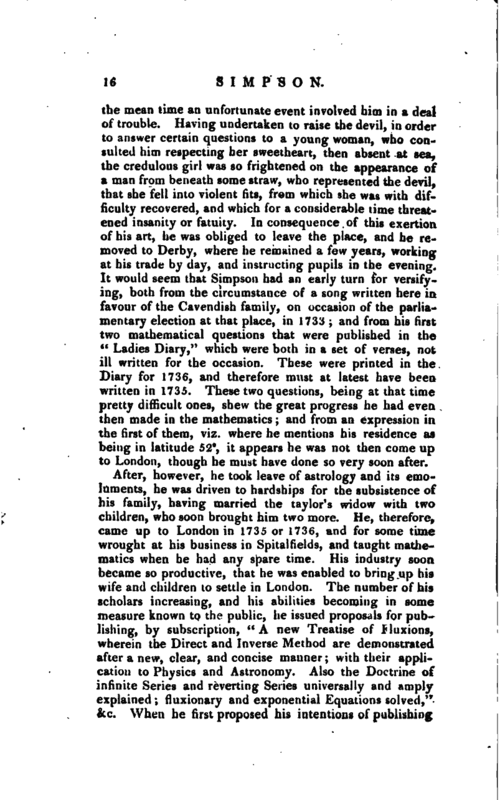 Mr. Simpson was also the editor or compiler of the Diaries from 1754 till 1760, both inclusive, during which time he raised that work to the highest degree of respect. He was succeeded in the editorship by Mr. Edw. Rollinson. It has also been commonly supposed that he was the real editor of, or had a principal share in, two other periodical works of a miscellaneous mathematical nature; viz. the “Mathematician,” and “Turner’s Mathematical Exercises,” two volumes, in 8vo, which came out in periodical numbers, in 1750 and 1751, &c. The latter of these seems especially to have been set on foot to afford a proper place for exposing the errors and absurdities of Mr. Robert Heath, the then conductor of the “Ladies Diary” and the “Palladium;” and which controversy between them ended in the disgrace of Mr. Heath, and expulsion from his office of editor to the “Ladies Diary,” and the substitution of Mr. Simpson in his stead, in 1753.
any of his Cornier publications. But he lived not to put the finishing hand to it. Whatever he wrote upon this subject, probably fell, together with all his other remaining papers, into the hands of major Henry Watson, of the engineers, in the service of the India company, being in all a large chest full of papers. This gentleman had been a pupil of Mr. Simpson’s, and had lodge ' in his house. After Mr. Simpson’s death, Mr. Watson prevailed upon the widow to let him have the papers, promising either to give her a sum of money for them, or else to print and publish them for her benefit. But neither of these was ever done; this gentleman always declaring, when urged on this point by Dr, Hutton and others, that no use could be made of any of the papers, owing to the very imperfect state in which he said they were left. And yet he persisted in his refusal to give them up again. Through the interest and solicitations of William Jones, esq. he was, in 1743, appointed professor of mathematics, then vacant by the death of Mr. Derham, in the Royal academy at Woolwich; his warrant bearing date August 25th. And in 1745 he was admitted a fellow of the Royal Society, having been proposed as a candidate by Martin Folkes, esq. president, William Jones, esq. Mr. George Graham, and Mr. John Machiu, secretary; all very eminent mathematicians. The president and council, in consideration of his very moderate circumstances, were pleased to excuse his admission fees, and likewise his giving bond for the settled future payments. At the academy he exerted his faculties to the utmost, in instructing the pupils who were the immediate objects of his duty, as well as others, whom the superior officers of the ordnance permitted to be boarded and lodged in hi$ house. In his manner of teaching, he had a peculiar and happy address; a certain dignity and perspicuity, tempered with such a degree of mildness, as engaged both the attention, esteem, and friendship of his scholars; of which the good of the service, as well as of the community, was a necessary consequence. In the latter stage of his existence, when his life was in danger, exercise and a proper regimen were prescribed him, but to little purpose for he sunk gradually into such a lowness of spirits as seemed to injure his mental faculties, and at | last rendered him incapable of performing his duty, or even of reading the letters of his friends; and so trifling an accident as the dropping of a tea-cup would flurry him as much as if a house had tumbled down. The physicians advised his native air for his recovery; and, Feb. 1761, he set out, with much reluctance (believing he should never return), for Bosworth, along with some relations. The journey fatigued him to such a degree, that upon his arrival, he betook himself to his chamber, where he died, May 14, in his fifty-first year. 1 Gent. Mag. vol. Lui. Mutton’s Dictionary. Nichols’s Leicestershire.